The adventure begins here. Yes, it begins at a Waffle House. I am here at Waffle House. I am here at Waffle House where it all began. Where I realized for the first time that there are thin places. These thin places are where the miraculous Spirit pushes forth in all its glory and breaks through into this hard and edgy life of ours. One of the thin places is in a Waffle House in Kansas City. A couple with no place to call a true home wandered into the church where I work on a warm day in January. He needed medication; she needed hope. While the pastor listened to the man I took the woman/girl (for that is truly what she is–caught in the between of teenager-not-yet-adult) to the Waffle House down the street to apply for a job. We slid into a booth and she nervously asked for an application. I lied and told her I was hungry, that I wanted to order lunch. “Go ahead and order whatever you would like,” I told her as the manager brought over an application. Name. In neat handwriting she purposefully wrote each letter. Phone. I didn’t hesitate. I told her the church’s number. She filled out the rest of the front page. Employment. Schooling. She was proud that she had recently finished high school. It was the inside of the application that gave her pause. There were word problems on how to make change and figure tax. Across the booth I began coaching her through the steps to calculate the tax. “I just helped my daughter with a similar math problem the other day.” I hoped my words came out more reassuring than they sounded when in truth I was sitting there praying my own daughter wouldn’t be in this position one day. Dear Lord, please let Katarina make wise choices. Please. Please. Please. Amen. The manager stopped by the booth again, and she and the woman/child spoke for a few minutes. Then it happened. The thin place appeared. “I am willing to give anyone a chance who needs one,” the manager said in her amazingly gentle but firm voice. And in a whoosh I realized that what the manager just said was a succinct version of The Good News. There are chances and re-chances and missed chances and chances again. There is brokenness with a side of hope. I have thought about this experience many, many times in the last six months. 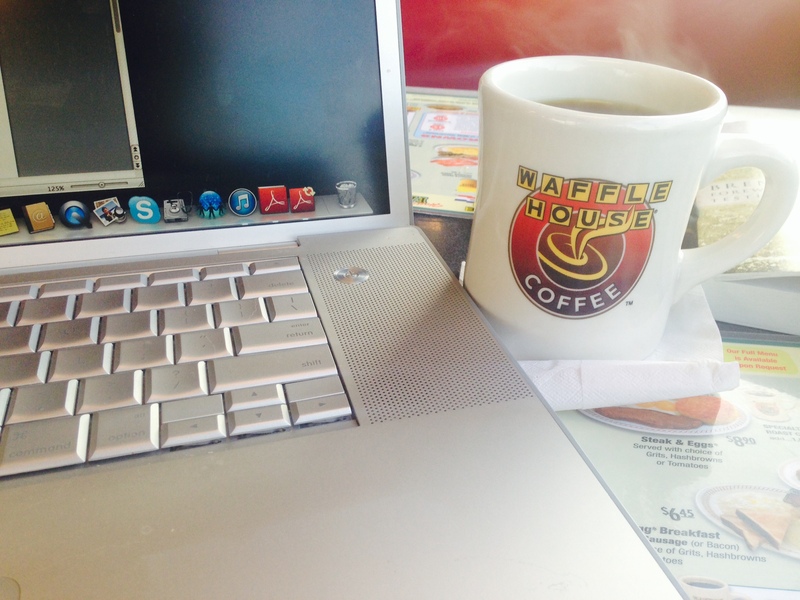 In fact, I had decided yesterday that I would come back to this Waffle House and write about my first experience with the thin place; the first time I witnessed The Good News being preached in a very real and dirty way—and not from a pulpit. I wanted to return to the place that made me hungry to be an eyewitness to more thin places in hope of experiencing more of God. I had decided to return today. 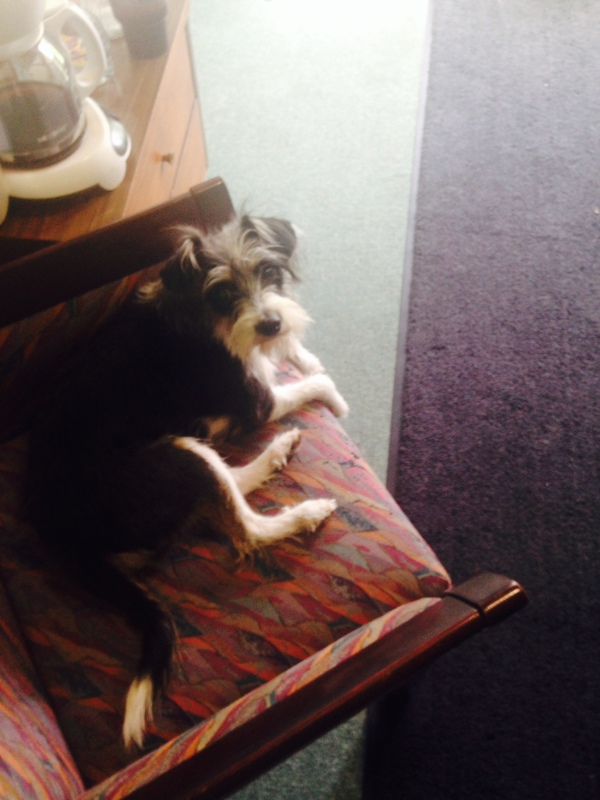 Today, she walked through my office door dragging a suitcase, a purse, and a dog named Sister Sue. It was she—the woman/child. I greeted her by name as she collapsed into a chair and unloaded all her recent drama. Readers, she is in worse shape than before. I ask you to pray for her; God knows her name. 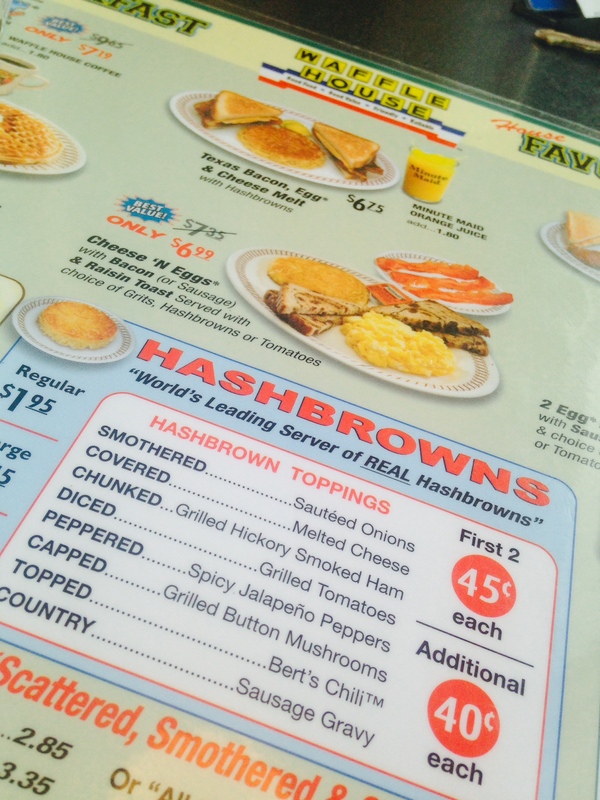 Just pray for a side of hope…scattered, smothered, and covered hope. How do you like your hashbrowns? I order mine scattered, smothered, and covered. This blog begins here. Here we begin seeking out the thin places. Join with me on this adventure and let us look together. Amen. You are simply sensational and such a motivation to me, not to mention a darn skippy amazing friend. Thank you for motivating me to continue my quest to serve as a beacon of hope to many who are hopeless thus in turn helping to usher in thin places. You are exceptional. Love and hugs! Onward – go bravely! E, I love seeing the gospel lived outside the pulpit as well as boldly from the pulpit. I look forward to reading about His grace in the thin places and will pray for you as you write. Love to you and your family. Girl – you made me cry! I love it! Keep letting your light shine! Scattered, smothered, and covered in God’s perfect love. Thank you for sharing your experience and words of inspiration. I’m on the edge of my booth. Wow! I’m so proud! Look forward to the insight and understanding in your next blog! This was truly a nugget of goodness! You inspire, encourage, and nourish others with your writing! So glad to call you my younger “sister”! Love and hugs!!! Elizabeth, your writing is inspirational. I’m looking forward to many more blogs. I just ran into the term “thin places” last week at the national gathering of the Community of Aidan and Hilda. Serendipitously it shows up here- a lovely use of the term!